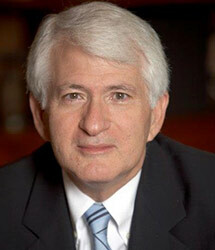 Gene Block was appointed UCLA Chancellor on August 1, 2007. Prior to joining UCLA, Mr. Block served as Vice President and Provost at the University of Virginia, where he was also the Alumni Council Thomas Jefferson Professor of Biology. During his 29 years there he served as Vice President for Research and Public Service and as Director of the National Science Foundation Science and Technology Center in Biological Timing. An expert in circadian biology, Gene Block’s research career has focused on the brain mechanisms responsible for 24 hour rhythms. His laboratory was the first to demonstrate that 24 hour rhythms can be generated within single neurons in an invertebrate model. His current research focuses on the effects of aging on biological timing in mammals, including humans. Mr. Block’s contributions to neuroscience research and scientific leadership have been recognized by his election as an American Association for the Advancement of Science Fellow in 1997 and the NSF Pioneer Award in 2003. He holds faculty appointments in psychiatry and biobehavioral sciences in the UCLA David Geffen School of Medicine and in physiological science in the College of Letters and Science. As chancellor, Gene Block oversees all aspects of the university’s three-part mission of education, research and service. He has defined academic excellence, civic engagement, diversity, and financial security as priorities for his administration. A champion of public universities, he has called for UCLA to deepen its engagement with the city of Los Angeles and to increase access for students from underrepresented populations. His efforts at improving diversity at UCLA were recognized in 2009 with the Los Angeles NAACP Foundation President’s Award. Mr. Block serves on the boards of several leading national associations, including the Association of American Universities, the Association of Public and Land-grant Universities, and the Council on Competitiveness. He is also a member of the American Academy of Arts and Sciences. Gene Block earned a bachelor’s degree in psychology with distinction from Stanford University and a master’s and Ph.D. in psychology from the University of Oregon.